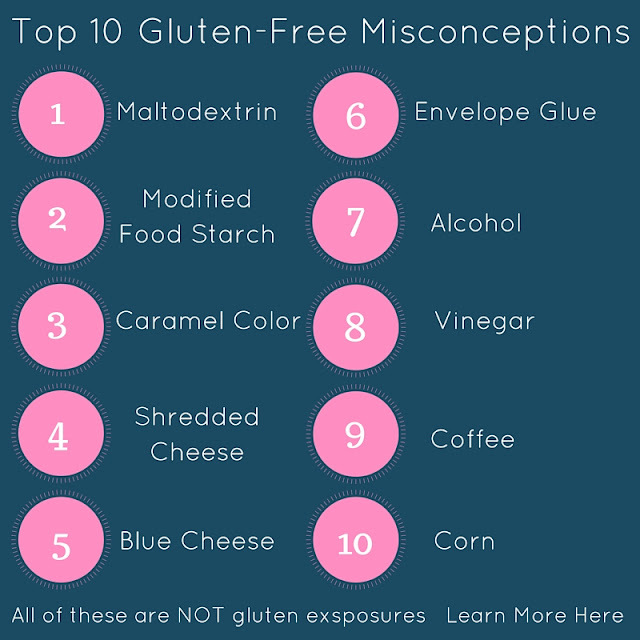 Gluten-Free living is incredibly complicated, especially when you are listening to outdated, incorrect information about what is safe to eat or not eat. Over the eight years I’ve been writing about thriving gluten-free, I’ve found some pieces of celiac lore that just won’t die, even once completely disproven. The reason so many of these urban legends continue to have life is because folks are searching for answers. They understand that they have to avoid wheat, rye, and barley but don’t know the other names that can be on the label instead. Now that many people go to communities and groups in social media, the spread of inaccuracies happens in real time as people share what they have heard "somewhere" once again. Some of the groups have fabulous administrators who vigilantly ferret out those inaccuracies and correct them. Others don't, and occasionally some will assist in the spread of them. Be really careful about who's information you are following. 1. Maltodextrin doesn’t have malt; it is a sugar. Products made in other countries than the USA can have wheat-based maltodextrin and must be labeled as such. It is never made from barley or rye. 2. Modified Food Starch – If made from wheat has to be labeled as such; It is never made from barley or rye. 6. Envelope Glue – There’s no gluten in envelope glue, according to the International Envelope Manufacturers Association. Just in case you have old fashioned stamps, they don't have gluten either. 7. Grain Alcohol – The distillation process removes all gluten, just watch for gluten being added back with flavorings. I wrote this post to explain further. 8. Vinegar – Distilled vinegar and apple cider vinegar are both fine. Only vinegars that have gluten added back with the flavorings are a problem. In the USA, malt vinegar which includes barley malt as the sweetener. 9. Coffee is naturally gluten-free-there is no such thing as cross reactivity to gluten, but watch for flavorings.